GO Performance Products is a young, dynamic industrial products marketing company that was established in 2007 with two key areas of focus: manufacturing its own products and marketing other companies’ products. Starting with its first globally unique Chain Wax, GO Performance has added several variants and an effective degreaser. The company also exports PS2 Tyre Fluid on behalf of the manufacturer. GO Performance’s uncompromisingly dependable products offer some of the most advanced and sought-after technologies the world has to offer. The company is committed to supplying only the best quality products as they become available. Product users include listed companies such as Mittal Steel, Sasol, Sappi, PG Bison, and a host of others. GO Wax Lube is a unique 100% biodegradable, non-toxic emulsion lubricant designed for optimum performance. Originally developed for chains, it is now used in a broad variety of lubrication applications. GO Wax Lube is a wax-based, solvent-free, long-lasting dry lubricant for industrial, mining and agricultural chain applications. The lube is especially effective in environments with a high density of air-borne dirt and dust such as cement plants, sawmilling, fertiliser plants, mining and agriculture. However, its applications are virtually limitless, including forklifts, cranes, hoists, conveyor chains, and many more. The formulation ensures the chain / part runs cleaner in contaminated, heavy-duty environments while providing exceptional lubrication where needed. GO Wax is not sticky nor oily so it does not attract or hold dirt and contaminants on the chain / part, as is common with other lubes. Therefore, no grinding paste is formed, allowing the chain / part to run with less friction, increasing performance and extending working life. This makes it suitable for applications that previously could not be lubricated due to the risk of dirt build-up. Go Performance’s SprayWax has the same qualities as the regular wax lube with the added benefit of a slightly lower viscosity, enabling it to be applied via a pump action spray nozzle. Hard to reach areas with a squeeze bottle are now a thing of the past with the SprayWax option. GO SprayWax is available in a 500ml (16.9fl.oz) spray bottle. GO Eco Degreaser is an excellent general purpose degreaser that can be used for all heavy industrial, light-duty and even domestic cleaning. The degreaser is environmentally friendly with state-of-the-art properties that penetrate dirt and grime for effective cleaning. It is 100% biodegradable, non-toxic, non-caustic, non-flammable, non-volatile and contains no solvents. GO Eco Degreaser is perfect for degreasing chains, engines, motorbikes, quads, floors and walls. It is also a superior washing product that is widely used for washing cars, motorcycles and quads without streaking or eliminating lubrication in sensitive areas. It also offers highly effective cleaning for carpets, vehicle interiors, removing rubber marks on vinyl, etc. and to spot-clean stained overalls and clothing. 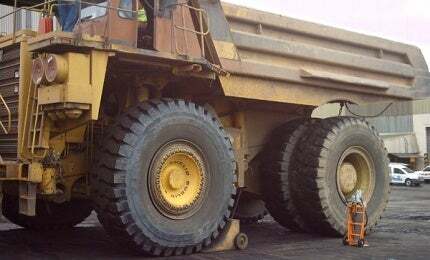 PS2 Tyre Pressure Stabiliser was developed for the mining industry to maintain tyre pressures in underground fleets. PS2 is a specially formulated product designed to keep tyre pressure constant for unlimited periods of time and sealing leaks as soon as they occur, ensuring less downtime. The fluid is an internal sealing compound for any commercial pneumatic tyre, forming a seal that is permanent and will last the life of the tyre. It contains millions of microscopic fibres, natural particles, special non-flammable adhesives and rust and corrosion inhibitors. GO Wax Lube, a unique wax lubricant designed to lubricate chains, engineering tools and equipment, as well as industrial, semi-industrial and DIY home woodworking equipment, is constantly excelling in the toughest conditions in Africa. GO Performance offers a wax-based, solvent-free, long-lasting dry lubricant for mining and industrial applications. The lube is especially effective in environments with a high-density of air-borne dirt and dust such as cement plants, sawmilling, fertiliser plants, mining and agriculture. GO Performance's Eco Degreaser is an excellent general purpose degreaser available in standard and concentrated industrial strengths for all heavy industrial and light-duty cleaning.